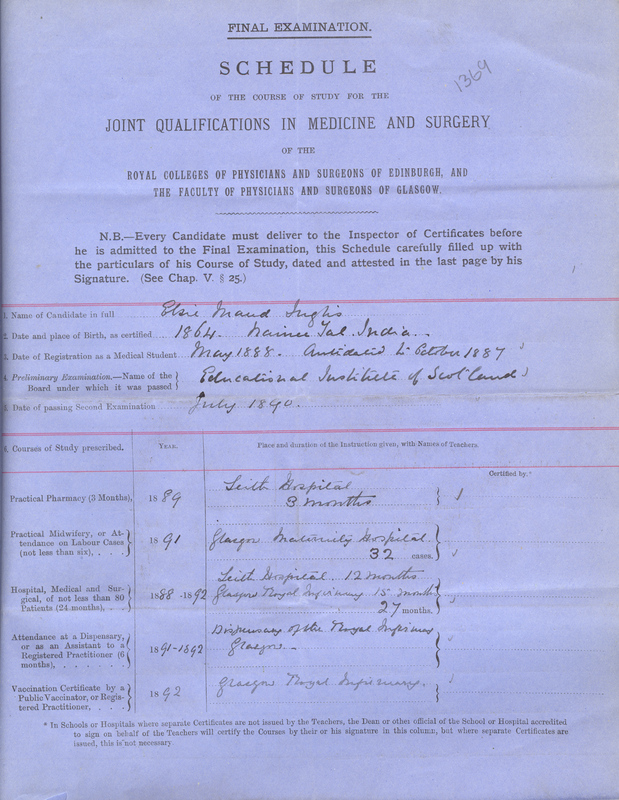 To coincide with a talk by Iain Macintyre on 5th August at Edinburgh’s Central Library on surgical pioneer Elsie Inglis (as part of the public engagement programme on women and warfare run by our colleagues at the Museum) this week’s Archive blog offers a snapshot into Inglis’ path to medical and surgical qualification through the Scottish Triple Qualification (TQ). An extension of the Double Qualification in Medicine and Surgery of 1859, the TQ Diploma was offered jointly by the Royal College of Surgeons of Edinburgh (RCSEd), Royal College of Physicians of Edinburgh (RCPE) and the Faculty of Physicians and Surgeons of Glasgow (FPSG, later RCPSG). The Diploma survived until 1993, with its longevity owing much to its flexibility in accommodating a diverse range of candidates hoping to pursue an alternative to university education; for instance, doctors arriving in Scotland from overseas in order to escape racism or war in their home country. The TQ was particularly emancipating for women, whose gender denied them matriculation at any Scottish university until 1892. 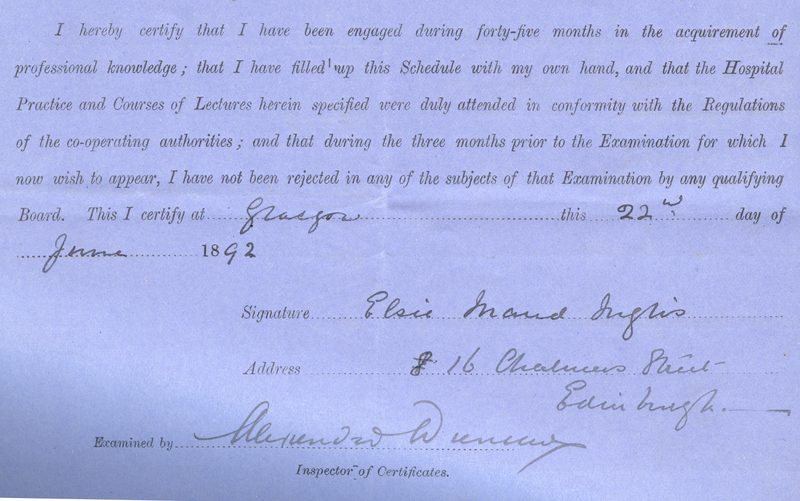 That same year, Elise Inglis was awarded the TQ, also becoming a Licentiate of RCSEd (the first female recipient of the TQ was in 1886). In addition to a compulsory curriculum of theoretical courses with both medical and surgical elements, candidates were required to undertake hospital and dispensary work. 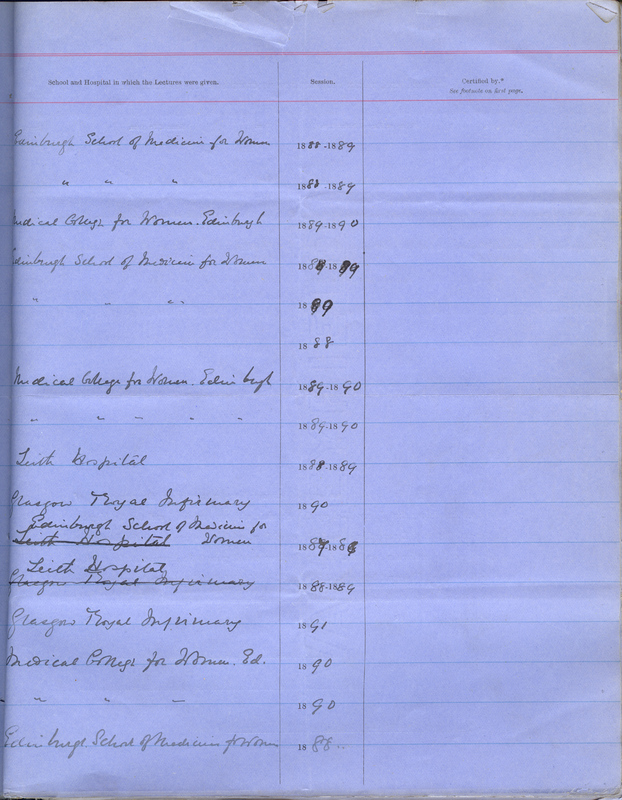 From her Schedule, we can see Inglis gained clinical experience at Leith Hospital, Glasgow Maternity Hospital and Glasgow Royal Infirmary (including its Dispensary) between 1889 and 1892. 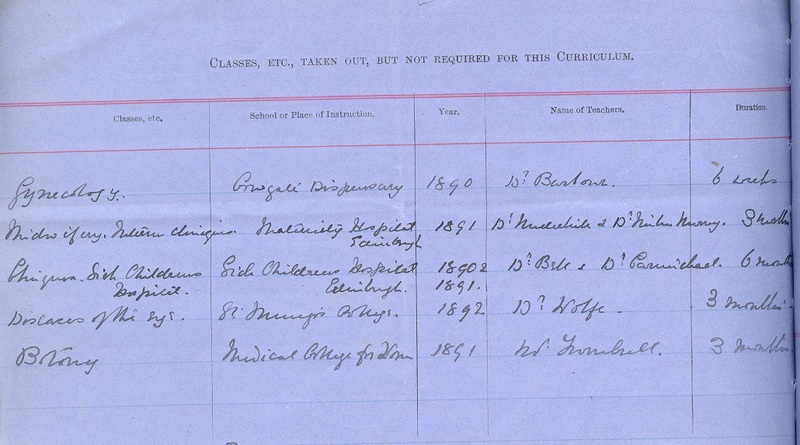 She also took additional ‘CLASSES, ETC, TAKEN OUT, BUT NOT REQUIRED FOR THIS CURRICULUM’ at the Cowgate Dispensary, Maternity Hospital Edinburgh and Sick Children’s Hospital Edinburgh. As illustrated, Inglis commenced her training at Sophia Jex-Blake’s School of Medicine for Women, which opened in 1886. Yet, following a student rebellion against Jex-Blake, Inglis helped found the rival Medical College for Women, which opened its doors in 1888 and where Inglis continued her medical training. The College holds the Single, Double and Triple Qualification examination records, revealing candidates from wide ranging backgrounds. 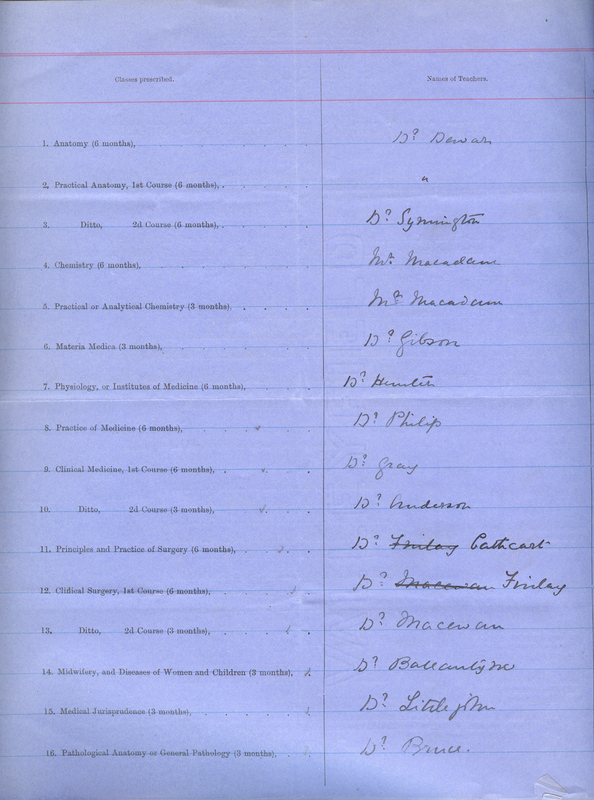 As cataloguing progresses for the Wellcome Trust project, the blog will highlight stories of individuals who chose this route to medical and surgical practice. Helen Dingwall, ‘The Triple Qualification examination of the Scottish medical and surgical colleges, 1884-1993’ Journal of the Royal College of Physicians, Vol. 40 (2010).